President Obama gives the go-ahead for one of the world’s largest concentrating solar power projects. President Obama and DOE Secretary Steve Chu were busy this past weekend approving massive loan guarantees to solar projects in the U.S. as part of the federal stimulus. 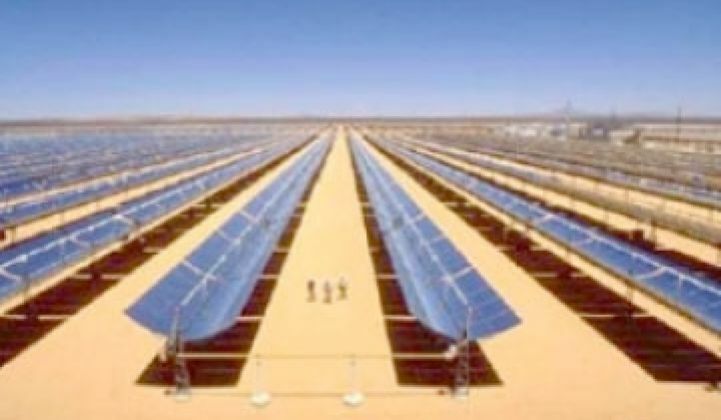 The biggest announced project was Abengoa's 250 megawatt Solana Concentrating Solar Power (CSP) project in sunny Gila Bend, Arizona, 70 miles southwest of Phoenix, which is backed by a $1.45 billion loan guarantee. That slightly surpasses the recent $1.37 billion loan guarantee for fellow CSP player Brightsource Energy. I spoke with Santiago Seage, the CEO of Abengoa Solar about the project this morning. The loan guarantee process was started over a year and a half ago. According to the CEO, "It has been a long process with lots of work with the DOE. It is expensive and not an easy process but the DOE has been very professional and they have invested enough time to do things very thoroughly." The project will proceed in two phases. Phase one, permitting, has taken about two and a half years, and that's "too long" and "one of the weaknesses of working in the southwestern states," according to the CEO, who added, "There's lots of room for improvement." Phase two, the actual construction of the project, will take another two and a half to three years. The CEO said that “this conditional guarantee could allow us to start construction of Solana this year." The Solana project is a trough-based system, as opposed to the Brightsource power tower design. Abengoa works with architectural products, as well as with photovoltaics. "Our belief is that CSP is a better option with bigger plants or where you need dispatchability," according to the CEO. The project also incorporates six hours of molten-salt storage that also improves the dispatchability of the power. According to the CEO, the cost of electricity is not very different whether or not storage is used, but the value to the utility is improved, as Solana will be able to generate electricity well into the evening. The two-tank molten salt storage scheme is relatively new; Abengoa built a demonstration facility in southern Spain in 2008 and it has only been used in a few other solar projects, although molten salt technology has been used at different temperatures in other applications in various industries. Abengoa Solar signed a power purchase agreement with APS, the state’s largest electric utility, to sell the energy produced by Solana for a period of 30 years. Abengoa Solar has made it a priority to utilize U.S.-made components wherever possible for the Solana plant. More than 75 percent of the equipment and supplies required to build Solana will be manufactured in the U.S. This includes steam generators, heat exchangers, power equipment, glass, steel, concrete and other construction materials. As a direct consequence of the construction of Solana, a mirror manufacturing factory will be built in Surprise, Arizona, which will employ close to 180 people. Greentech Media's CSP analyst, Brett Prior, commented: "The Solana project is estimated to cost almost $1 billion, and this loan guarantee will ensure that the project moves forward. As the first large CSP project in the US with thermal storage, this project should also help to demonstrate the advantages and economics for molten salt storage." Prior is working on the 2010 CSP report for GTM Research, which should be published late summer. As part of the report, he will be analyzing the trade-offs involved in wet versus dry cooling. The Solana plant was originally planned to be wet-cooled, which would require ~1,600 acre feet of water per year. That equates to 1.4 million gallons per day. According to Prior, "the Solana plant will face a much easier permitting process if it elects air cooling. 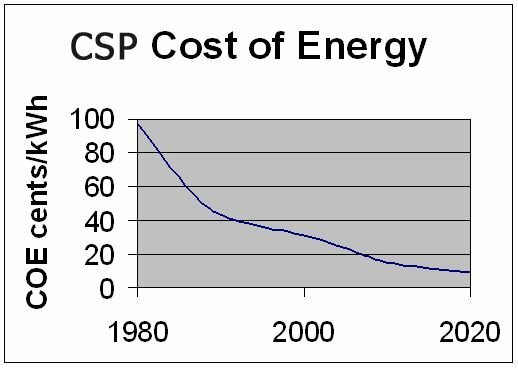 The problem is that dry cooling costs substantially more (cost of electricity is ~10% higher), which may break the economics of the project. 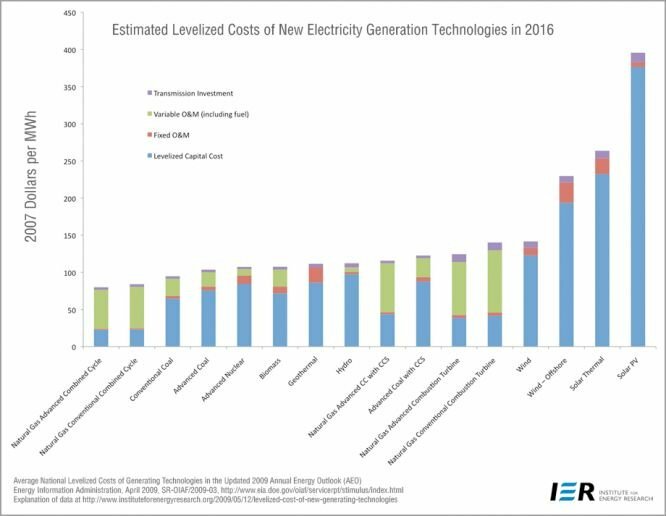 The estimated PPA price is ~$0.14 per kilowatt-hour with an escalator, while trough has a levelized cost of ~$0.17 per kilowatt-hour. So adding another 10 percent to the cost could make the project unattractive to Abengoa." 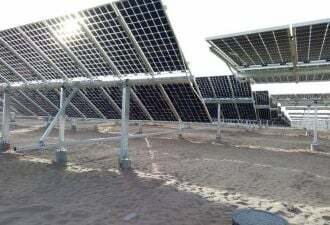 He added, "While this is neither the most land-efficient (trough requires 8 acres per megawatt versus 3 acres per megawatt), nor the most cost-efficient solar option, this is a nearly shovel-ready project using proven technology. So, the DOE approval definitely makes sense." Abengoa Solar is currently building 350 megawatts of solar plants worldwide, and with an additional 142 megawatts already operating, the company claims that it is the only firm worldwide that is building and operating both trough and power tower CSP plants. The Solana plant will be Abengoa Solar’s tenth CSP plant worldwide. But these IER data points suggest that solar thermal has a long way to go to reach any kind of parity with other generation sources. The CEO expects to be spending a lot of time in Gila Bend, which has an average July high temperature of 109°F (43°C).